It has become a familiar path to follow: a budding basketball talent transitioning to NFL tight end. But the journey of Zach Ertz is different from the rest, influenced by an insightful, supportive mother, and an NFL great who saw a football phenom before the phenom ever did. Zachary Adam Ertz was born on November 10, 1990, to Lisa and Douglas Ertz in Orange, California. 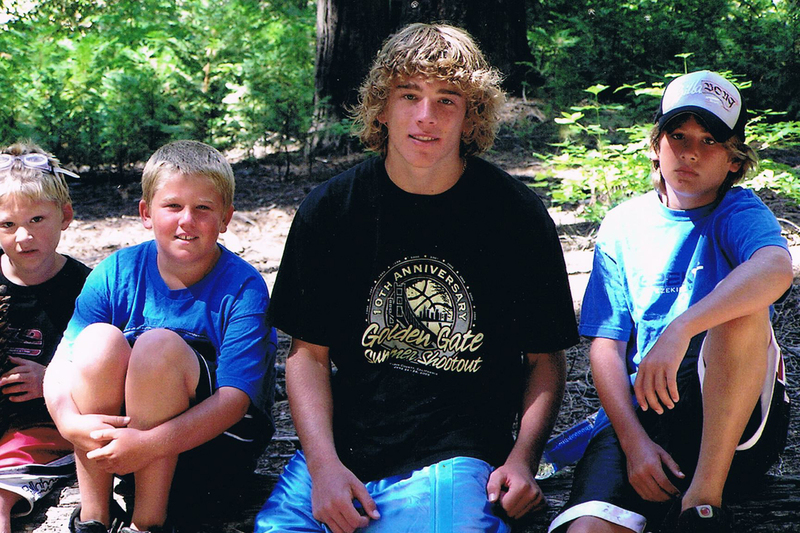 The family relocated to Northern California when Zach was just seven years old, a move that would later have a significant impact on Zach’s evolution as an athlete. Ironically, in his youth, football was far from Zach’s mind. The eldest of the four Ertz boys participated in virtually every other sport, from soccer to baseball to swimming. But Zach’s true love from a young age was basketball. He had the size for it right from the beginning. The same traits that made Zach an excellent basketball player from a young age actually made it difficult for him to develop a passion for the game of football. But his mother, Lisa, encouraged Zach to continue to play other sports, and that included giving football another try. Initially, he resisted, worried that his continued growth would put him right back on the offensive line, just as he’d been a few years earlier. Eventually, though, Zach relented, joining the freshman football team at Monte Vista High School in Danville, California. This time, rather than putting him in a position he didn’t enjoy, Zach’s height made him the star of the team. He played quarterback, receiver and safety on the MVHS freshman squad, all the while discovering a new found love for football. Around the same time, Zach’s family life began to change. His parents divorced during his sophomore year of high school. Ultimately, it brought Zach even closer to his mom Lisa, who became his primary caretaker and confidant. As the oldest of the four Ertz boys, Zach also took on a larger role in the house. He and his three younger brothers — Shane, Nick and Jackson — still spent time with their father, who lived close by. But their home life revolved around their mother and each other. Zach took it upon himself to set an example for his siblings to follow. Even though Shane and Nick are in college and Jackson is a high school freshman, it’s a responsibility Zach continues to take seriously. Throughout high school, Zach’s interest in football grew, but he continued to balance it out with basketball, something that he believes assisted him in playing both sports. It also taught him about time management, personal responsibility and priorities — life skills that he was able to develop and translate into success on and off the field. 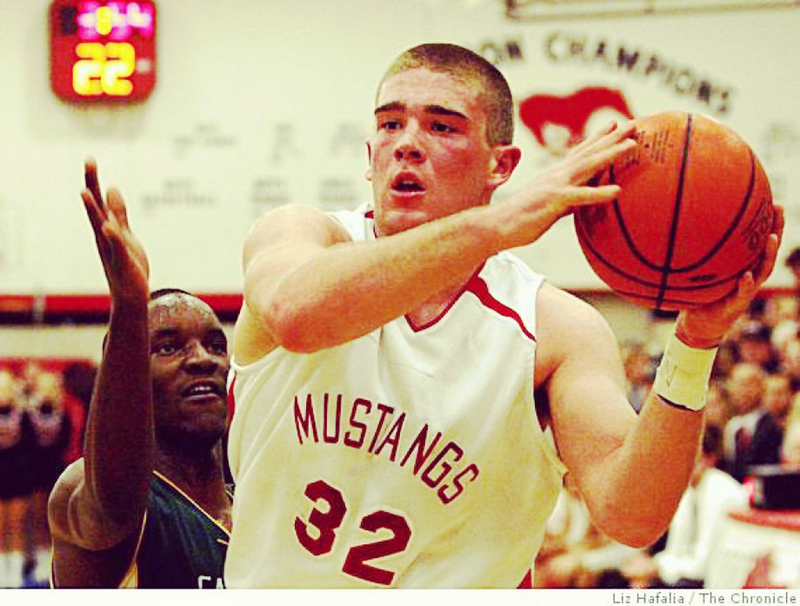 Zach still saw a future in basketball as his ultimate path. 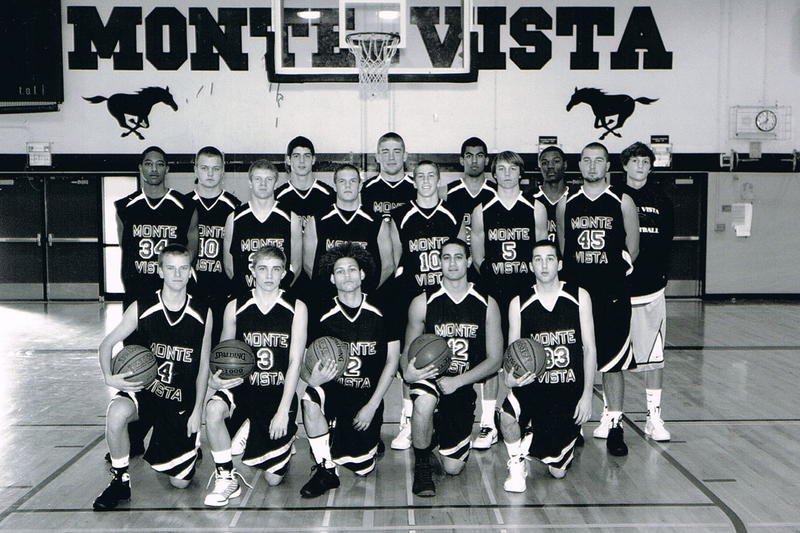 However, others around him saw it differently, particularly Monte Vista High School head football coach Craig Bergman. When Zach made the jump from JV to varsity in between his sophomore and junior years at MVHS, Bergman enlisted the help of Brent Jones to guide Zach on a path to success at the tight end position. Jones, a Bay Area native, was also one of the top NFL tight ends of his generation. 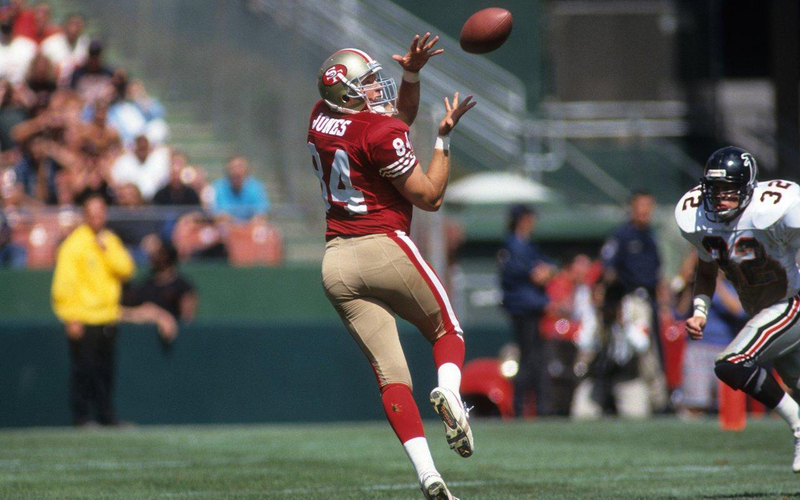 He played 11 years with the San Francisco 49ers, earning four Pro Bowl nods, three All-NFL selections and three Super Bowl titles. When Bergman came calling, Jones had been away from football for nearly a decade. Still, the Monte Vista High football coach knew the former 49er had daughters playing soccer at MVHS. Bergman reached out to Jones on a whim, telling him about the budding tight end prospect he had on his squad, and inviting him out to a practice. The hope was that Jones — who had no coaching experience — would nonetheless make Zach his pupil. All it took was one look, and Jones was on board. According to Zach, football still wasn’t something he took very seriously when he met Jones. He didn’t consider himself a football fan, and had just a cursory knowledge of Brent Jones as a player. Although the game had become more fun in high school, he had yet to discover a passion for it. Jones changed that in short order. Zach’s first summer working with Jones began a meteoric rise from basketball standout with football talent to football standout with star potential. In his first game of his junior season against rival James Logan High, Zach caught seven passes for 118 yards and a touchdown. A week later, he scored three more touchdowns in a win over West High. It didn’t take long for scholarship offers to start rolling in. Zach credited much of his success to his relationship with Jones. In retrospect, their relationship — which he maintained through college to the present — was a gift. A wrist injury brought an early end to Zach’s junior season in high school, but the offers didn’t slow down. As it became clear that football was going to earn him a college scholarship, he had another important decision to make. Once again, he turned to his mother for guidance. Zach was initially torn between offers from two Pac-10 football factories: UCLA and Stanford. Lisa Ertz stepped in to break the tie, and made Zach see the value of a Stanford education. Zach committed to Stanford in November of his junior year, but there was still the important matter of getting into one of the nation’s toughest academic institutions. It required Zach to work harder at his studies during his senior year than he ever had before to hold down a 3.5 GPA while balancing AP classes, football and basketball. To this day, Zach looks back on his senior year at Monte Vista and the hard work he put in to earn acceptance to Stanford as an important moment in his life. Zach spent his first year at Stanford redshirting on the football team. In truth, he was still relatively new to the game, and the extra time allowed Zach to get to know college football better. It also gave him a chance to get his academic career off on the right note. On the recommendation of teammate Toby Gerhart, Zach took some classes in management science and engineering — known elsewhere as industrial engineering. He went on to pick management science and engineering as a major. It was another test. He could have opted for an easy major and focused more on football. But that wasn’t what Zach wanted out of his college experience. In his sophomore year, Zach finally got a chance to excel on the gridiron. In Stanford’s first game of the 2010 season, No. 86 hauled in two passes, one of them for a red zone touchdown in the Cardinal’s 52-17 win over Sacramento State. “When the coaches trusted me to go in there and catch a touchdown pass, that’s when I knew I could be a successful player at the college level,” Zach said of his first college score. Zach was lightly used by Stanford during his sophomore season, playing behind quarterback Andrew Luck’s favorite target, tight end Coby Fleener. But when he did get opportunities, Zach made the most of them. Of his 16 receptions as a sophomore, five of them went for touchdowns, including an early score in Stanford’s 40-12 Orange Bowl win over Virginia Tech. Zach also built a strong bond with coach Jim Harbaugh. Harbaugh transformed the Stanford football into a winning program, and had enticed Zach to join the movement. The Orange Bowl victory and the return of most of the team set Stanford up to be the Pac-12 favorite in 2011, and a national championship contender. But Harbaugh, who had built the program from perennial disappointment back into a powerhouse in just four short years, would no longer be along for the ride. Harbaugh was hired to coach the San Francisco 49ers, and David Shaw, the man who had the biggest hand in Zach’s recruitment, became Stanford’s head coach. Indeed while many outside expected the Cardinal to fall off after Harbaugh’s departure, they continued to rise. 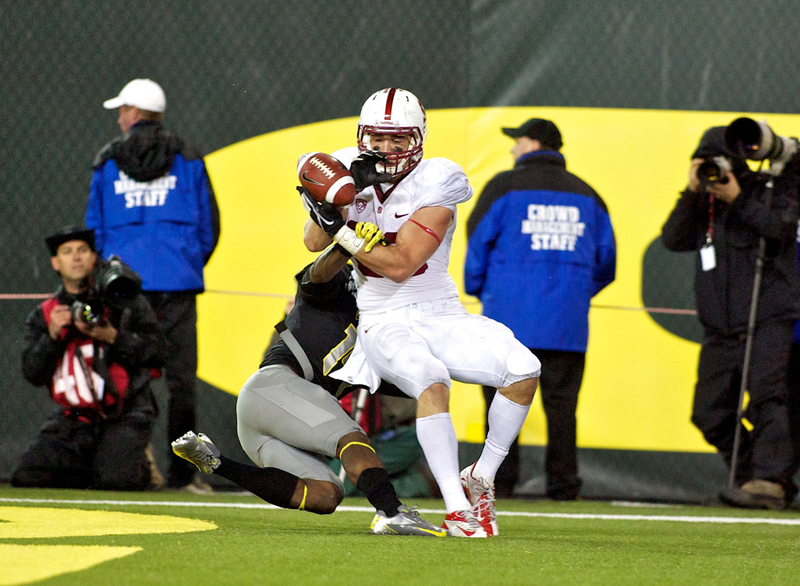 Stanford opened Zach’s junior season with nine straight victories, and Zach was an integral part of their success, scoring touchdowns in each of the first three games of 2011. Unfortunately, Zach’s junior campaign was setback by a knee injury suffered in a Oct. 29 thriller against rival USC. “We were playing very well as a team, undefeated at the time, and it was tough knowing I was going to miss four or five games with a knee injury—something I couldn’t control,” Zach recalled. With Zach sidelined, No. 3 Stanford’s hopes for an undefeated season were derailed by a loss to No. 6 Oregon on November 12. Zach returned briefly in the regular season finale, a win over Notre Dame, but didn’t get much chance to make an impact. He was ready for their team’s bowl game just over a month later, however, a Fiesta Bowl date with Oklahoma State. Stanford lost a shootout with the Cowboys, but No. 86 put together another a strong finish to a season with four catches and a touchdown. They were the last balls he would catch from Luck, who became the No. 1 overall selection in the 2012 NFL Draft. Still, playing two seasons with Luck as his team’s quarterback was an invaluable experience. Zach credits the signal caller with aiding his rapid growth as a tight end. With Luck and Fleener departed for the NFL, Zach took center stage for his senior season, and he quickly became the number one target for Stanford’s quarterbacks. A month later, Zach helped the Cardinal bounce back from a loss to Notre Dame with a six-catch, 134-yard, one touchdown outing in a win over Cal. But his signature performance came in a crucial November showdown with Chip Kelly’s Oregon squad at Autzen Stadium, home of the Ducks. Oregon, ranked No. 1 in the country at the time, was lined up for a national championship berth. No. 86 hauled in a career-high 11 catches, including a touchdown with 1:35 remaining that tied the score and sent the game to overtime. After Oregon’s kicker missed a field goal at the outset of the extra session, Stanford’s Jordan Williamson drilled his kick from 37 yards to send the Cardinal to victory. The Cardinal won again the following week, completing the regular season at 10-2, 8-1 in conference for the second straight year, But this time, thanks to the win over Oregon, Stanford earned a spot in the Pac 12 title game. In a fitting twist, Zach found himself facing the program he had strongly considered four years earlier: UCLA. 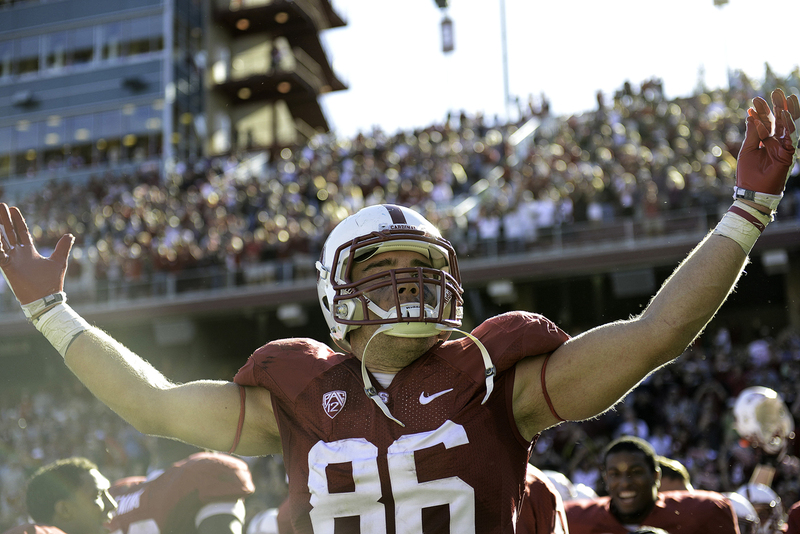 Stanford won the game, 27-24, to earn a berth in the Rose Bowl against Wisconsin. The Cardinal completed the incredible season with a 20-14 victory over the Badgers, culminating Zach’s second 12-win season with a second BCS Bowl win. The season-ending run, which included a national championship-derailing win over Oregon, a Pac-12 title clinching victory over UCLA, and a Rose Bowl title, will go down as the highlight of Zach’s college career. Zach decided to forego his remaining year of college, and move on to the next stage of his life. After completing his degree in management science and engineering in the spring, the NFL was calling. He got coach Shaw’s blessing to answer that call. NFL scouts also let Zach know he was ready to take the next step. Many ranked him the top tight end prospect in the 2013 draft. And after another season when passing offenses were led by standout tight ends like New England’s Rob Gronkowski, New Orleans’ Jimmy Graham and Atlanta’s Tony Gonzalez, Zach and Notre Dame’s Tyler Eifert were both expected to go in the first round. The 2013 NFL Draft also marked just the fourth year that the draft was airing its first round in primetime on a Thursday night. That made draft night even more nerve-wracking for prospects like Zach, who were unsure if they’d hear their name called in the first 32 picks. For a brief moment midway through the first round, it looked as though Zach might continue his career in Northern California. The San Francisco 49ers traded with the Dallas Cowboys, moving up 13 spots to No. 18. Based on meetings with the team and his close relationship with 49ers coach Jim Harbaugh, Zach knew that San Francisco was interested in him. But the 49ers used the pick from Dallas to select safety Eric Reid. 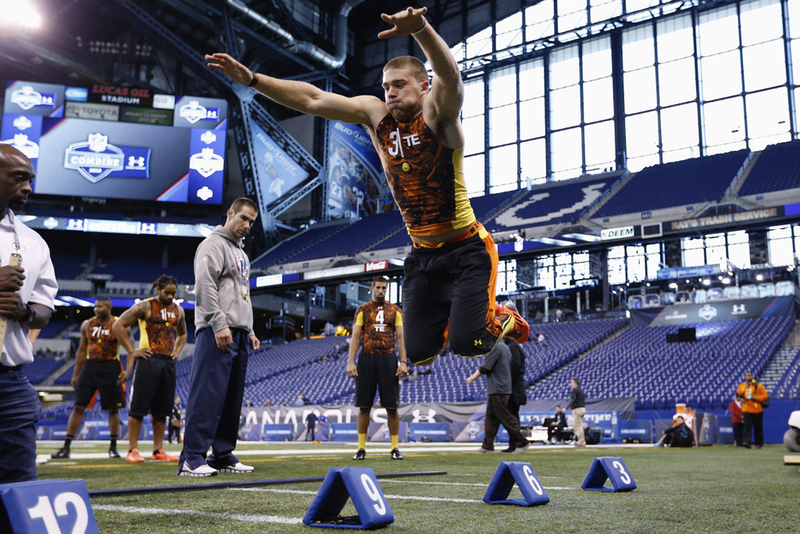 Three picks later, the Cincinnati Bengals selected Eifert at No. 21 overall. In the 11 picks that followed to complete the first round, only three offensive players came off the board, two wide receivers and a center. Zach was forced to wait another day to learn where the next step in his career would take him. He didn’t have to wait long. The Philadelphia Eagles, coached by his old college rival Chip Kelly, made Zach the 35th overall pick, the third pick of Day 2. With Kelly at the helm of the Eagles, Zach found himself in a familiar offense, ready to help change the pace of the NFL game. There was no redshirt season in the pros. No. 86 was thrust right into the action, playing in all 16 regular season games for the Eagles as a rookie, and catching passes in all but two of them. In Week 9 of the 2013 season, Zach had his biggest game of his young career back home in Northern California. Against the Oakland Raiders, Zach hauled in five passes for 42 yards — including his first NFL touchdown — in a 49-20 Philadelphia win. Three weeks later, Zach tied his career mark with five receptions, including two more touchdowns, in a win over Arizona. He was a crucial element in the Eagles offense down the stretch of his rookie season, and Philadelphia won seven of its final eight regular season game, clinching the NFC East crown and a playoff berth. Zach finished the year with 36 receptions for 469 yards and four touchdowns. He added three catches for 22 yards in a Wild Card round shootout with the Saints, the last of which — a three-yard touchdown pass with under five minutes remaining — briefly staked Philadelphia to a one-point lead. Unfortunately, New Orleans came back and kicked a field goal as time expired to end the Eagles’ season. But experiencing the playoff atmosphere in Philly as a rookie made Zach even more determined to accomplish more with the Eagles in subsequent seasons. Both Zach and the Eagles entered his second season with high aspirations, and year got off to a great start. Zach had a touchdown catch in the season opening win over Jacksonville, and again hauled in passes in all but one game for the team. Philly ran out to a 9-3 record entering the month of December with another NFC East crown in their sights. But three straight losses knocked them out of the playoff picture. Zach noted that the disappointing finish to the season made him appreciate the hard work needed to reach the postseason in the NFL. There was also plenty to build on. In the second to last game of the season, No. 86 had the best game of his young career, hauling in an Eagles record 15 passes for 115 yards. He finished the season with 58 catches for 702 yards and three touchdowns, one of the best receiving seasons among tight ends in the league. The 2015 season began with a setback for No. 86. He underwent an operation to repair a groin injury during the offseason and missed valuable time building a rapport with Philly’s new quarterback, Sam Bradford. Zach returned for the start of the season and began to hit his stride midway through the year—only to suffer another scary setback. While trying to hurdle a defender for first-down yardage against the Tampa Bay Buccaneers, ZE was upended and landed on his head and neck, sustaining a concussion that sidelined him for the remainder of that game and the following week. But when Zach returned, he picked up right where he left off, hauling in his first touchdown of the season in a monumental win over the New England Patriots. A 98-yard performance followed in a win over Buffalo, and he carried that forward with 78-yard effort while pulling down another scoring reception against the Arizona Cardinals. ZE then broke his career-high with 122 receiving yards—but the big week was spoiled by a loss to the Washington Redskins that ended Philly’s chances at the playoffs. But even though the Eagles were left out of the postseason, they finished the regular season strong. Zach again shattered his career-high amassing 152 yards on nine receptions. 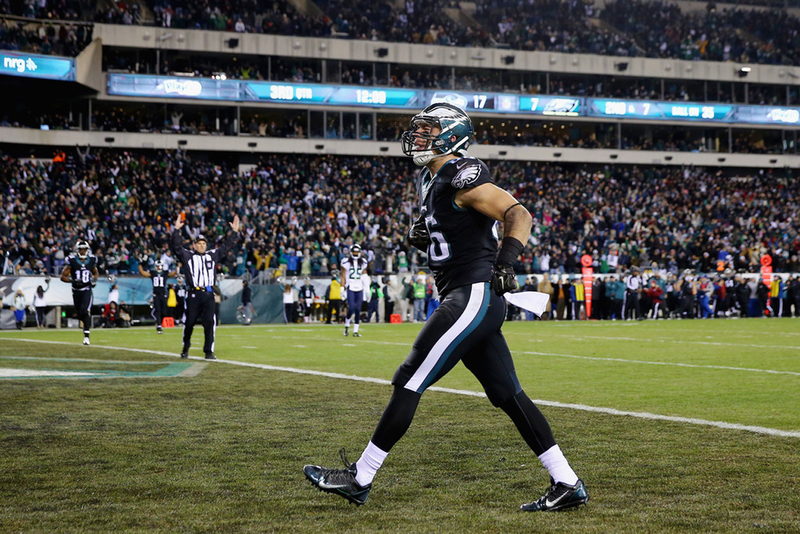 Behind ZE’s outstanding day, Philly beat the New York Giants 35-30 to close the regular season. It all boiled down to another step up for No. 86. Zach made strides in his pass blocking, which resulted in his snap count skyrocketing. His targets went up to a career-high 112. His receptions: a career-high 75. He ended the year with 853 receiving yards and more than 2,000 in his three-year career. The Eagles took notice. On Jan. 25, Zach signed a five-year contract extension to keep him right where he wants to be: in Philadelphia. Then in 2016, the Eagles drafted quarterback Carson Wentz with the second overall pick in the NFL Draft, and ZE continued his impressive play on Sundays. Zach led the Eagles with 78 receptions that season, which was also a career-high for No. 86, and he compiled 816 yards and four touchdowns while developing chemistry with his new rookie signal caller. Zach finished 2016 strong, racking up 75 or more receiving yards in four of his final five games, including his best performance of the year in Week 17 against the Dallas Cowboys. No. 86 caught 13 of 16 targets for 139 yards and two touchdowns in a late season effort that would help him carry some momentum into the off-season. The following season in 2017, ZE cemented himself as one of the NFL’s premier tight ends as the Eagles dominated their regular season competition on the way to a 13-3 record under head coach Doug Pederson. For the third straight season, Zach racked up over 70 catches and 800 yards through the air, but in 2017, he doubled his previous touchdown total by reaching the endzone eight times in 14 games. The chemistry and growth between Wentz and No. 86 was evident as Zach became a reliable third-down target as the season progressed toward the postseason. After Wentz suffered a season-ending injury in Week 14 against the Los Angeles Rams, many questioned whether Philadelphia would be able to sustain their Super Bowl-caliber play. They closed the season with two more wins and a loss to the Cowboys in Week 17 as they rested many starters with a first-round bye already secured. In the Divisional Round, the Eagles hosted the defending NFC Champion Atlanta Falcons and prevailed in a 15-10 slug fest. Zach managed 32 receiving yards in a game that didn’t feature much offense. The following week, Philadelphia routed the Minnesota Vikings in the NFC Championship Game and romped to the Super Bowl with a 38-7 victory. No. 86 led the game in receiving yards with 93 on eight receptions while Alshon Jeffery and Torrey Smith caught touchdown passes from Nick Foles. And LeGarrette Blount, Jay Ajayi and Corey Clement ran through a stout Vikings defense with some physical run-blocking from Zach and the offensive line. Two weeks later, the Eagles would face off against Tom Brady and the New England Patriots, winners of five Super Bowls since 2002. ZE rose to the occasion and stepped up when his team needed it most. Throughout the game, No. 86 made a number of crucial third- and fourth-down receptions that moved the chains and kept drives alive. But the biggest moment came in the waning moments of the fourth quarter of Super Bowl LII. With the Eagles trailing 32-33 with just over two minutes to play in the game, the Eagles faced a third-and-seven. Foles hit Zach on a slant route and No. 86 took care of the rest. Zach beat Devin McCourty on the play and dove across the goal line to put the Eagles ahead for good and claim the city’s first ever Super Bowl title. After a long offseason of parades and celebrity appearances after claiming the Lombardi Trophy, Zach and his Eagles teammates reported to training camp in July to start working towards defending their Super Bowl championship. After losing a few talented pieces in the offseason, including Trey Burton and Brent Celek, the Eagles added Dallas Goedert in the draft to complement Zach at tight end. Now, Zach is the veteran in the tight end group and his play over the last few seasons has placed even more responsibility on his shoulders, and he responded in 2018 with perhaps his best season to date. No. 86 emerged as one of the premier tight ends in the NFL in 2018 as he continues to thrive in the Eagles’ offense. In the Eagles’ Week 13 win over the Washington Redskins, Ertz surpassed Brian Westbrook in the Eagles’ record books for the most receptions in a single season. 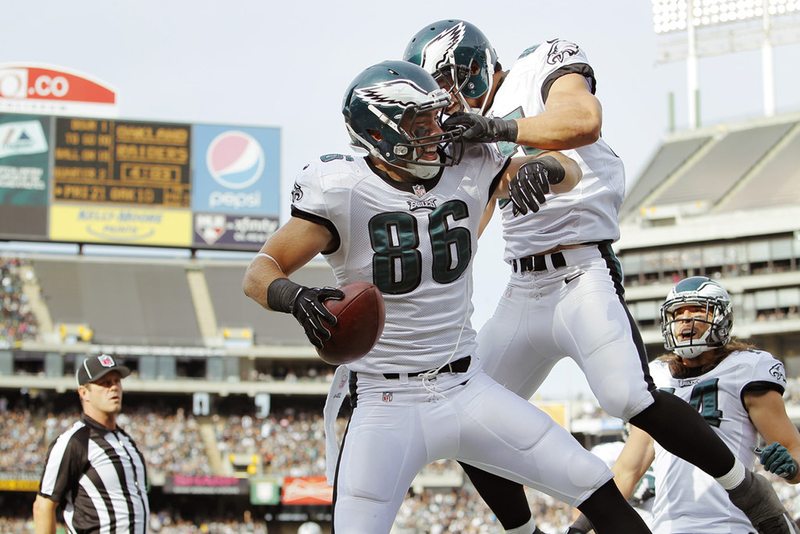 Ertz bested that record in a Week 16 win over the Houston Texans, when No. 86 surpassed Jason Witten’s NFL single-season reception record for a tight end. Zach finished the 2018 season with 116 receptions for 1,163 yards and eight touchdowns, cementing himself as one of the games best by earning a second consecutive Pro Bowl selection. More importantly, the strong finish to the season propelled the Eagles back into the playoffs to give them a chance to defend their title. In the Wild Card Round, the Eagles traveled to Soldier Field to take on the Chicago Bears and prevailed 16-15. Ultimately, Philly came up short in the Divisional Round, falling 20-14 in New Orleans against the Saints. The team battled through plenty of adversity throughout the season, and they certainly will be ready compete for another championship again next season.